Experimental theatre. If you have been reading our theatre adventures, you know this is something that we don’t normally attend. But when a fundraiser was announced for the Repertory East Playhouse (REP) after the recent debacle, I was in—no questions asked. So last night we were back at REP for “Solo-Palooza“, which was a collection of 10-20 minute monologues by theatre students from College of the Canyons that left me astounded at the level of talent and the passion of the students, as well as being pleased that REP was coming out of this stronger, with a greater commitment to do great theatre from both the staff and the community. Let’s start with the REP aspect first. For those unfamiliar with the story, during the run of REP’s previous show, Cat on a Hot Tin Roof, a patron got inebriated and started making audible anti-gay slurs during the second act. The actor playing Big Daddy reacted to these jeers not by requesting action from management, but by going into the audience and physically confronting the patron. The patron was ejected, the actor was fired (for creating legal risk for the theatre), another actor quit in support, the remainder of the run was cancelled due to the loss of actors, the issue hit the news and went viral on the Internet with a version of the story tilted towards the actor, and the theatre took a financial and publicity hit. Within a week of the incident, the show showed up with a benefit performance at another venue, with most of the actors, directed by the fellow in the audience who took the story to the media. Supporters of the theatre began speaking up when staff couldn’t, and fundraisers were organized to make up for the loss of ticket income from the production. Such is the love that this theatre engenders in the local community and the community of the people that know the theatre that they want this institution to survive. T-Shirts were sold, and two shows were organized to provide support. One of those shows was this show; the next is a stand-up comedy night next week. Of course, the best way to ensure the survival of the REP is to introduce new audiences to their quality and integrity. When you buy a ticket to their next show, Return to the Forbidden Planet, buy an extra ticket and bring a friend to the theatre. Next, let’s turn to the show itself. What is Solo-Palooza? Solo-Palooza is a product of the “Theatre 195: Solo Performance” class at the College of the Canyons. In this program, students from the class present original solo performance pieces that have been curated with COC theatre instructor and Solopalooza director Susan Hinshaw (FB) to be both socially provocative and highly entertaining. 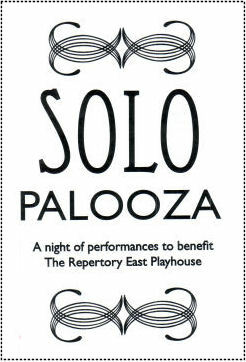 Over the years, Solo-Palooza has been performed at both COC and at REP; REP has been a strong supporter of the program. The most recent Solo-Palooza before this one was in early June at COC, and featured shows about “broken families, drug addiction, bullies, cheerleaders, being an outsider, being a twin, and an obsessive compulsive”. It was mentioned at the beginning of last night’s show that COC wanted to return the support to REP, and they proposed this special Solo-Palooza performance, with all the proceeds going to REP.
“Copy and Paste” (Ashley Rasch/FB). This was a story about a girl growing up with her identical twin sister. I was astounded with the enthusiasm and energy Rasch brought to the piece — she was flying everywhere and becoming different characters and ages, and was just astounding and funny and delightful to watch. “On the Outside Looking In” (Tyler Menjivar/FB). This was a story about growing up gay and trying to find your way as an outsider. One of the most interesting portions of the piece had to do with messages that we send–Menjivar related about hearing his parents talk about the fact that it was perfectly fine to be gay…. as long it wasn’t a friend, neighbor, or a family member. I was impressed by the emotion behind this story, and the physicality of the piece (Menjivar was pushed by … himself … on to the floor hard a number of times). “Nine Dresses” (Renee Poignard/FB). This was ultimately a story about a girls relationship to her mother who passed away too soon, and how that relationship was triggered by memories, odors, and actions. A touching and humorous piece. “Wrong Channel” (Jordan Haro (FB)). This was the piece that resonated with me the least. It was about a young man who learned his life lessons from television. There was a lot of patter about shows — especially kids cartoons — and the lessons they teach. Many of these were kids shows from the late 1990s that I never watched, and so the connections and in-jokes just missed me. The audience did appreciate, however, his performance of the theme from Speed Racer. “Fat Bottomed Girl” (Heather Frame (FB)). This was perhaps the piece that resonated the most with us — it was a monologue about a woman and her struggle with weight, with an addition to eating and of using food for comfort and nurture. This is something that my wife has struggled with, and even I’m having trouble with it (I’m finding it hard to lose weight). A really good and well-performed piece from the heart. “My Girl” (Joe Prata/FB). This was a piece I wasn’t sure I was going to like — it was a (hopefully fictional) talk by a man who murdered his wife with malace aforethought, after murdering her lover, and going on to kill more. At its heart, though, it was a story about a man’s relationship with his daughter, and the aftermath of a bad divorce. Although the presentation only gave one side of the story (part of the problem that was there in the original REP incident), it provided an odd understanding of an evil act. Very well performed. “Straight Lines, Full Circle” (Clare Tompkins-Cook/FB). Another piece about growing up, this time from the young lady who was serving as the host for the evening’s performances. It was about a girl’s hatred of pain and blood, and how the pain of her life and fighting at home led her to cutting — experiencing pain to awakeness from the numbness that life had brought to her. Tompkins-Cook portrayed a number of characters and emotions, and was just fascinating to watch. “Silence is Loud” (Kelsey Kosskove/FB). This was a story about a young woman dealing with the draw of silence on her life. Kosskove had a dancer’s body and dancer’s moves, and these highlighted this interesting piece. This was the piece that connected with my wife the least, for whatever reason. “Three Men” (Judge Boothby/FB). Boothby protrayed three angry men: a janitor talking to a student, a son talking to his father, and a third one I can’t remember. What I found interesting here — even more than the strong performances themselves — was the reaction to them from the other actors on the side of the stage. I also loved how Boothby just inhabited and transformed into each difference character. It was remarkable to see. The production was produced by Clare Tompkins-Cook/FB and Erin Cholakian/FB, with REP regular Taylor Kozlowski/FB serving as house manager, lighting, and sound tech. David Stears/FB was the event coordinator. There was only one performance of this piece. You shoulda been there supporting the REP. You’ll just have to come to their next show. Upcoming Theatre and Concerts: Tonight sees us back at our old haunt, the Pasadena Playhouse (FB), for “Stoneface: The Rise and Fall of Buster Keaton”. We finish off June with “I’m Not Just a Comic Genius” at Secret Rose (FB) on June 27. July will be busy: “Ghost” at the Pantages (FB) on 7/5, “Return to the Forbidden Planet” at REP East (FB) the weekend of 7/12, “Once” at the Pantages (FB) on 7/19, “Bye Bye Birdie” at Cabrillo Music Theatre (FB) on 7/26, and “Family Planning” at The Colony Theatre (FB) on 8/2. August then remains quiet as we work around vacations and such (but I’m eyeing a number of productions in Escondido, including “Two Gentlemen of Verona” at the Old Globe, and “Pageant” at the Cygnet in Old Town. What they have at the Welk (“Oklahoma“), Patio Theatre (“Fiddler on the Roof“), and Moonlight Stage (“My Fair Lady“) are all retreads. Things start to get busy again in September and October, with “The Great Gatsby” at REP, “What I Learned in Paris” at the Colony, and “Pippin” at the Pantages. More on that later. As always, I’m keeping my eyes open for interesting productions mentioned on sites such as Bitter-Lemons, and Musicals in LA, as well as productions I see on Goldstar, LA Stage Tix, Plays411.